TSSPDCL Hall Ticket 2018-2019: A direct link to download Telangana JAO AE Admit Card 2018-2019 is available in this article. The Telangana State Southern Power Distribution Company Limited is going to conduct the Junior Accounts Officer, Assistant Engineer Written Exam 2018 on 25th March 2018. Moreover, the written test date is coming soon. So, the officials of TSSPDCL is decided to release the TSSPDCL JAO Hall Ticket 2018 and TSSPDCL AE Hall Ticket 2018. At the below section you can get the direct Admit Card link. Therefore, we insist to the people to download your Telangana JAO AE Admit Card 2018-2019 from this post at free of cost. Hence, follow the below sections and get how to download the TSSPDCL AE, JAO Admit Card 2018 steps. Get the beneficial news from this article regarding TSSPDCL Hall Ticket 2018-2019. 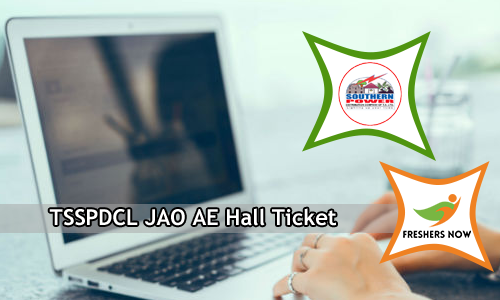 Moreover, a huge number of candidates are didn’t find the proper link to download TSSPDCL JAO, AE Hall Ticket 2018-2019. So, for the sake of contenders, we have tried our level best and shared the direct pdf link at the beneath of this post. Those who are planning to participate in the written test on 25th March 2018 need to download the TSSPDCL Hall Ticket 2018-2019 from here. Remember that you have to download the TSSPDCL Admit Card 2018-2019 for Junior Accounts Officer, Assistant Engineer Positions by entering your registration number and date of birth info. If you have any query related to TSSPDCL JAO Hall Ticket 2018-2019 and TSSPDCL Assistant Engineer Hall Ticket 2018-2019 just refer the below given mandatory points. Telangana State Southern Power Distribution Company Limited is shortly known as TSSPDCL. Every year a massive number of aspirants are participating in various examinations. Moreover, this year the TSSPDCL has released 267 Junior Accounts Officer, Assistant Engineer Vacancies. Many of the willing contenders had applied for TSSPDCL Recruitment 2018. Actually, the organization has released separate vacancies. Total 153 Vacancies for Assistant Engineer Posts and 114 Posts for Junior Accounts Officer Vacancy. After completion of the registration process, many of the people are very busy in their preparation time to participate in the written test on 25th March 2018. Finally, the TSSPDCL JAO AE Hall Ticket 2018-2019 is out. Therefore, all the candidates can easily download it from this post. Telangana JAO Hall Ticket 2018-2019 is a very valuable document for the candidates those who are going to participate in the written exam. Those who had applied for Junior Accounts Officer Post can now download the TSSPDCL JAO Hall Ticket 2018-2019 from the official website. Moreover, at the below section, we have given the direct link. So, examiners can download it from the below article. The authority of Telangana State Southern Power Distribution Company Limited is making all the arrangements to organize the written exam on 25th March 2018 at various exam centers across Telangana State. You have to carry your valuable TSSPDCL Hall Ticket 2018-2019 to the examination hall without fail. Meanwhile, aspirants need to follow some of the steps at the time of downloading the TSSPDCL JAO Hall Ticket 2018-2019. Therefore, you can get the detailed information from the end of this post. TSSPDCL AE Hall Ticket 2018-2019 is available now to download. As per the latest news, the TSSPDCL has scheduled the Assistant Engineer Written Exam on 25th March 2018. A couple of days back, the Telangana State Southern Power Distribution Company Limited is stated that they will release the TSSPDCL Assistant Engineer Hall Ticket 2018-2019 before 15 days of the written test date. Now it is the exact time to download the Telangana AE Admit Card 2018-2019. Moreover, you have to download the call letter from this article. In the end, we have attached a direct link. With the help of the direct link, aspirants can quickly download their necessary Admit Card. Ready to participate in the test. And the competition level is very heavy. At various exam centers, the Telangana State Southern Power Distribution Company Limited is going to conduct the written test. So, all the participating aspirants are suggested to check your Examination Centers very carefully in the TSSPDCL Hall Ticket 2018-2019. Maximum all the arrangements are done by the government so across the Telangana State you people need to participate in the written exam. At present many of the contenders are preparing hard to clear the written exam. We all know that the competition for TSSPDCL Jobs is going to be very tough. Part A consists of Questions from Cost and Management Accounting and Accountancy and Advanced Accountancy. General Ability comes under the Part B. 80 Questions will be asked from Part A. Meanwhile 20 Questions from Part B. The time limit of the test is 120 Minutes. So, aspirants are suggested to check the exam pattern before going to the test. The selection of the candidates is based on the Written Exam Only. The above given are the Qualifying Marks in written exam. Visit Freshers Now regularly. With the help of above links, you can quickly download the TSSPDCL Hall Ticket 2018. Hello . can anyone please help me on downloading the JAO hall tickets? Hi Santosh, Please recheck all the details provided. You should be able to download TSSPDCL hall ticket if your details are correct. If you still have issues, please check the appropriate authorities of TSSPDL. Please help me to download TS JAO Hall ticket. I am trying past three days to download hall ticket but all the time I am getting no details found message. I tried to call customer care number also they are not taking calls. Please let know how to contact TSSPCL autorities or any mail Id or their office address to contact. I too facing the same problem. if anyone knows how to download,please let us know.